Ballasted track is much more realistic than track that is merely fixed to the baseboard of your model railway layout. But it is more than that, it can be used to give your model railway the correct identity. By reference to images of a suitable prototype, you can select the type and colour of ballast to suggest the geographical area where your layout is set – and there is plenty to choose from! This one is Medium grade and red-brown in colour. The granules are not all exactly the same colour, making it very realistic. 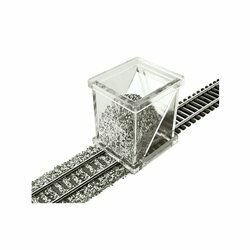 To assist with the task of ballasting your track, there are some very clever devices available from Proses. 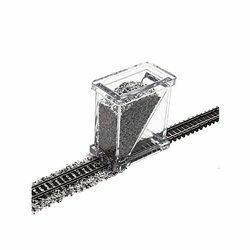 Have a look at the PROBS-HO-01 OO/HO scale Ballast Spreader or PROSES PROBS-N-01 Ballast Spreader for placing the ballast, and the PROBS-FIX-01 OO/HO scale Ballast Fixer or PROBS-FIX-03 N scale Ballast Fixer for fixing the ballast in place (very important to prevent it from getting into locomotive mechanism and point blades). Supplied in a bag containing 110g.